1) AVO this week announced a new era for the brand, which will include “contemporary packaging, new communication, and a streamlined range that focuses on core lines,” according to a press release from Davidoff. “The AVO portfolio has been streamlined to focus on its four celebrated core lines—AVO Classic, AVO XO, AVO Domaine, and AVO Heritage.” In addition, the brand presentation will more overtly associate itself with music, a nod to brand founder Avo Uvezian’s background as a jazz composer. 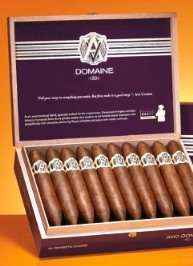 “The elegantly modern wooden box design displays the AVO logo on the lid, flanked with music bars featuring authentic debossed notes from Avo Uvezian’s songs… It is finished with an intensity meter, developed from scaling musical notes, that allows consumers to easily select the perfect cigar for that moment.” The new AVO products will begin shipping to U.S. retailers later this month. 2) The International Premium Cigar & Pipe Retailers Association (IPCPR) is in the process of buying property in Washington to serve as the organization’s headquarters. A three-story commercial townhouse in the Capitol Hill neighborhood has been selected. “Currently, the association has employees in five different states with headquarters in Columbus, Georgia,” according to a recent press release. “Mark Pursell, IPCPR’s CEO noted that, ‘The new headquarters will enable IPCPR to house its staff in one location creating a greater focus on all of the services we provide members and the larger industry.’” The move is expected to result in greater access to policymakers and the ability to host congressional events. 3) Inside the Industry: The delayed, but much awaited, limited edition La Flor Dominicana Beer Stein has finally shipped to retailers; it comes complete with 20 1994 anniversary cigars. Altadis is launching a new Romeo cigar called Romeo Añejo, which will sport a Connecticut Broadleaf wrapper, Dominican binder, and Nicaraguan and Honduran filler. 4) Deal of the Week: Nub fans should be all over this sampler. Just $25 gets you 8 cigars ($3.12 per stick). Included are two each of the four first Nub blends: Connecticut, Cameroon, Habano, and Maduro.